Just playing around with this idea a bit yesterday. I’m sure it’s a terrible idea to work on this project when the main game I’m working on is still unfinished, but once in a blue moon I feel compelled to work on this 2D action-roguelite that I’ve had in my head in some form or another since 2012. The driving idea behind it is a minimalistic 2D game based on capturing the feel of a DBZ fight. LBZ is the closest game I can think of which is out there, and it’s not quite what I want in terms of game feel or style. I think there’s a total of like 20 days of work on this spread across 5 years, so I put this out there with that huge disclaimer. For more of an explanation on what this actually is, it’s loosely based on the combat in DBZ. You control a very tiny and fast square. It can fly / teleport and shoot energy attacks. I’m the yellow dude in this video. The circle around me is how much energy I have. Flying, teleporting, and energy attacks drain energy. Energy automatically regenerates after not using any for a short period of time. Energy regenerates 2 times faster if you’re (more or less) stationary. If you fly into the opponent square, a melee collision happens, and the loser gets damaged and knocked back. The winner is determined by whoever was moving faster in the opponents direction. It’s all about momentum. I’ve been spending my time taking my single threaded game and making it multi-threaded in an effort to improve performance. I honestly thought that I could get away with the entire game being single threaded, but it gets noticably choppy late game and I’d like to fix that. I think if this game was strictly turn based like most 4x games then it’d have been fine, but it’s not. You press one of the speed buttons up top, and then turns start happening automatically on a set interval depending on the speed chosen. On the fastest speed, turns happen about once every 600 milliseconds, so when the game was a single thread those 600 milliseconds were essentially wasted. The game was waiting until the 600 milliseconds were up in order to calculate the next state of the game world. It led to a noticable pause every time a new turn occurred. It’s been a good learning experience, though I do wish I did this sooner. I’m also taking this time to refactor other aspects of the code. For example, the code responsible for the grid is something that I wrote in 2012, and I was making things up as I went along back then. I still am to be honest, but I’ve got more of an idea nowadays. The grid was entangled too much with code specific for this project. What I want instead is something independent which can be reused in other projects. It’d also be nice if it supported multiple grid types (square, isometric, hex). So I spent some time making that happen. Code is now cleaner and more flexible. 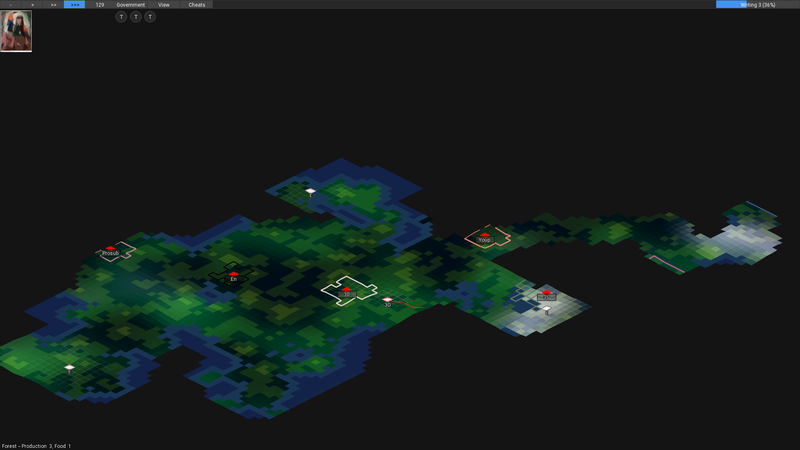 Also now supports square, isometric, and I spent about an hour last night adding in hex support. The game is mostly agnostic to what type of grid it takes place on, so I can now generate a world using any of those grid types, which is pretty cool. I’d have to do some work to make it truly playable on a hex grid (AI code would need to account for the different grid type for instance), but curiosity of how this would look as a hexmap got the better of me. So yeah, the method I described yesterday for allowing the AI to pick city locations is now implemented and seems to be working all right. It needs some tweaking, but I think it’s a good start. 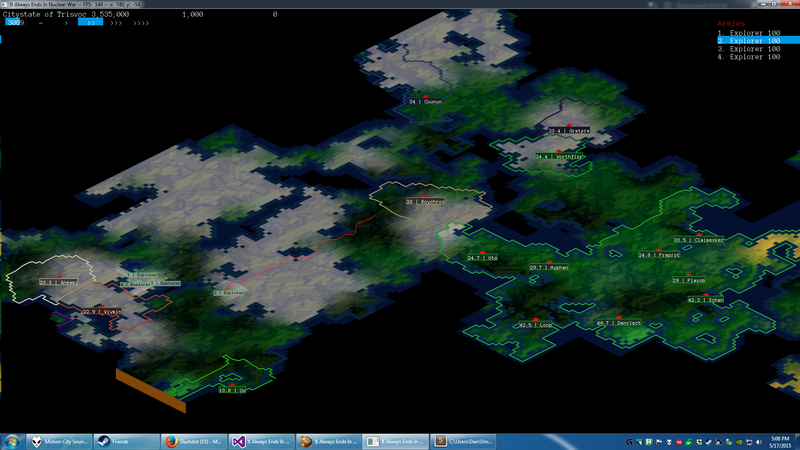 Today I’m going to try to implement an algorithm which picks city locations for the AI. If you’ve ever played civilization, you should have a good idea on what this means, as it’s more or less the same problem from that game. Maps in my game are much larger than in Civilization, and my game ticks along at like 1 turn every 600 milliseconds, so performance is a pretty huge concern. I’ve come up with something that I think will work (high level code outline below), but I wouldn’t be surprised if there’s a much better way of going about it. // continent might need to be reworked to make more sense. // locations are going to be updated. For calculateCityLocations(), I’m thinking that I’m going to divide the map up into a larger grid, with each cell in this larger grid representing let’s say a 5x5 group of cells. Perhaps that size will be determined by the city ring size. I then think I’m going to assign a city location in the center tile of the actual grid for each cell in this large grid. So essentially calculateCityLocations would be iterating over each city in this list and moving the city location over 1 tile for each loop iteration, based on the best location of its neighbors. If the initial city location happens to be on a water tile, I’ll have to do a check to make sure that doesn’t happen or fix it when it does. I already have a function which ranks how good any given city location is, but I’m going to need to expand that function to take into account tiles which are already owned by another city (obviously those tiles would be degraded in importance). I’m aiming to do all of this today, but we’ll see how it goes.